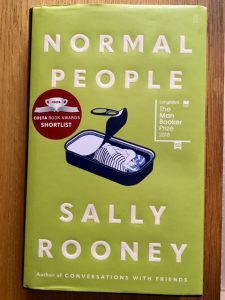 This entry was posted in Irish literature and tagged Faber and Faber, Normal People, Sally Rooney by Simon Lavery. Bookmark the permalink. LOVE IT. This reminds me a little of other “of the moment” young 20-something writers. Thinking of Tama Janowitz, who is my age, and whose coming-of-age-in-New-York-City collection of stories “Slaves of New York” was a sensation at the time, and seems to have become a modern classic since. After not writing a book since 2005, Janowitz came out in 2016 with a very well-received memoir, of her passage from the “Lit Girl” of 80’s New York to the stage of “living past youth” in a tiny town in upstate New York, dealing with sarcastic and dismissive adolescent kids, death, caregiving to a father with dementia, and the homely daily duties of “poodle wrestling,” etc. It is hard to be glamorous and cool in our 50’s and 60’s! Am I right in thinking Slaves was televised or filmed? I seem to remember a rather alternative sort of female character, maybe along the lines of Madonna in Desperately Seeking Susan? Surely we can still be glam and cool once we pass 50?! Well, *be* controversial, Simon! We can’t all like the same thing and I honestly don’t think it would be for me. Perhaps I’m just too old and crabby to identify with young lovers, although the couples’ background does sound pretty awful. And definitely the style sounds like something I would struggle with…. I did wonder if I was inviting a backlash (John Self tweeted along those lines in response to my link there!) Mrs TD reminded me that it wasn’t just the father and brother who were cruel to Marianne – her mother was too, maybe more in a psychological way. So as a study of a damaged young woman adapting to adult relationships, it has some good insights. Just wasn’t entirely to my taste. And yes, it’s good to have different takes on a text. I can see why this novel has struck a chord with so many. Let me just say that I love it when there’s a review like this from someone whose opinion I trust. I was deeply suspicious about the hype over this book because it appeared to come straight out of Narcissism 101. You have saved me from feeling even the slightest temptation if I see it on the shelves at the OpShop, or even for free at the library. IMO Goethe cornered the market for Narcissism 101 back in 1774 with The Sorrows of Young Werther, and there is nothing more that needs to be said. I wasn’t too keen on Werther,either!